G3 02. William Alphonsus (1871-1927), was born 17th May 1871 in Clonmel. 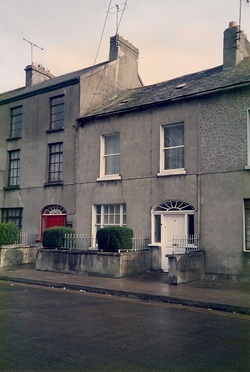 William lived with his father Charles at 31 Main Street, Clonmel where he assisted his father in the drapery business and eventually inherited the shop, where he continued to work in until his death 14th August 1927. He did not marry and died intestate leaving £671 3s 5d which was shared equally between his sisters Mary (Dolly) Fennessy and Margaret O'Connor, and his brother Gerald. Dolly, who had another draper's shop at 4 West Gate, then bought out the rest of the family's interests in William's shop. G3 03. Charles (1873- 1891), was born 7th March 1873 in Clonmel. He died in 1891 aged eighteen. Byrne family papers, from her aunt Mary Byrne. (In turn, she left the papers to her son Kevin Fennessy). Dolly died 22nd March 1955 aged eighty. Kevin worked most his life in Tipperary County Council, and he took an active interest in the Byrne family history. On his retirement, he became Curator of the then newly formed Clonmel Museum where he was regarded as an authority on Clonmel history. G3 05. Joseph (1876-1881), was born in Clonmel 23rd April 1878 but he died 19th December 1881, aged only four. G3 06. Elizabeth Clare (1881-1895), was born Clonrnel 8th March 1881. She died in August 1895, aged fourteen.